When you think of on and off-road adventures, what do you picture? You should be picturing yourself in a Nissan Titan. This is a truck for even the roughest, toughest off road aficionados including workers, back roaders, and outdoor sportspeople included. Whether you need a truck for fun or work, the Nissan Titan is always the right choice. It’s a spectacle to behold and true to its name, available in a wide variety of packages that blend technology, durability, power, and towing versatility with an avalanche of standard options. Just drive it; you won’t have any regrets. The Nissan Titan line spans a few different styles; choose from packages like the single, king, or crew cab configurations based on your lifestyle and activity level. Make the choice between two or four-wheel drive; if you’re offroading, all-wheel is obviously best. From there, you have five grade levels to choose from, each with an insane amount of horsepower and a massive seven-speed transmission for epitomized control and power. All Titan half-tons come with a 390-HP Endurance 5.6-liter V8 engine. Nissan covers all Titan models with bumper-to-bumper coverage (5 years or 100,000 miles, whichever comes first). Labeled, “America’s Best Truck Warranty,” it’s your reassurance that you’ll always be covered if something breaks down – but few drivers ever actually need it. That’s because the Titan is, well, a true Titan reliability-wise. When you choose a Nissan pickup truck, you are choosing one of the most durable and long lasting trucks available. Quality components, sky-high standards, intense artistry in design, and a real interest in what drivers want make the Titan a trustworthy old friend that’s constantly evolving, too. The first-generation Titan full-size pickup set the standard of design for the new models. It also successfully broke the class by gaining popularity right away. Nissan engineers and design teams keep that in mind when they create each new version, adhering to the, “if it ain’t broke, don’t fix it” mentality. Throughout every evolution, Nissan maintained all standards while ensuring room for actual improvement. Many of the Titan’s features have been adapted and upgraded over the years. The original workhorse truck, bed, and cab features are now considered industry standard. Rugged durability, innovative interiors, and performance design features are present across all models including the newest Titan XD. We’re talking about improved aerodynamics via the active grille shutter, front, roof, and tailgate spoilers, front tow hook hole covers, rear tire wind deflectors, and hermetic seal between the cab, bed and underbody. All of these features are designed to reduce drag and improve fuel efficiency in the Titan, which used to struggle with fuel consumption due to its size. Aerodynamic features are uncommon in pickup trucks, making the Titan a unique and innovative truck. You may think of a pickup truck interior as being sparse and utilitarian. The Titan is here to change your mind. Utility and storage are addressed with easy-to-use switch layouts, driver controls and extra storage spaces that give you a place for everything (and keep everything in its place). Drivers will find the newly-relocated shift lever on the steering column easy to reach and use. The much larger center console area also improves on the need to reach for items that you may need while you’re out on the road. Driver and passenger seating features all Zero Gravity seats to prevent driver fatigue and increase comfort on long rides. Added 12-volt and 110-volt power outlets, remote engine start, and a premium 12 speaker Rockford Fosgate audio system rounds out the easy access features that are both useful and nice to have. If you’ve ever ridden in a work truck and noticed a lot of noise and vibration in the cab you’ll find the Titan’s laminated front and side glass, engine noise isolation and body sealing make a big difference. A smooth, quiet and comfortable ride in a pickup truck? Yes, the Nissan Titan finally makes this a reality. Along with interior and exterior changes, the new Titan emphasizes durable off-road performance. With a durable chassis design, double wishbone front suspension and rigid rear suspension, leaf springs, and bushings with twin-tube shock absorbers, it’s an impressive beast! Added features, including hill descent control, brake-limited slip differential, hill start assist, off-road gauge, and electronic locking rear differential significantly benefit drivers who need extra power and performance for work or play. When you want to travel where no one else can go, you need a trustworthy friend by your side. The Titan IS that friend. Spur of the moment off-road trip? Quickly and easily lock into four-wheel drive and you’re on your way! 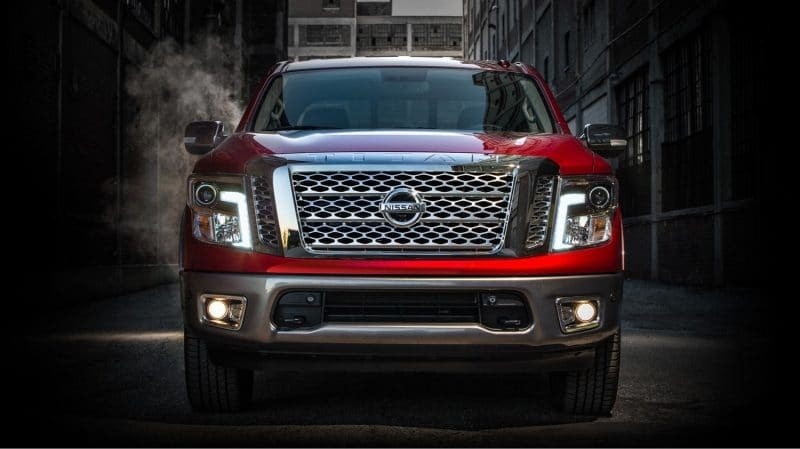 If you are in the market for a new work or family truck, we can’t help but encourage you to take a look at the Nissan Titan Visit at an El Paso Nissan dealer today to explore the options and choose your favorite package.